CAA is planning the next Twin Cities Veg Fest for 2017. Organizing this event takes place over five months. Committee members are responsible for specific tasks related to the festival. 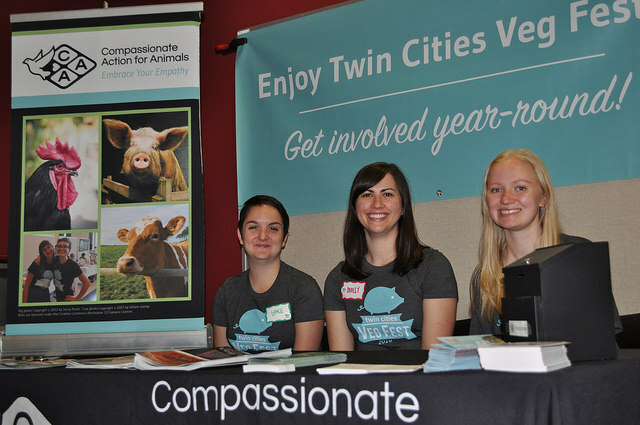 Twin Cities Veg Fest is a one-day event focused on vegan food and outreach. The goal is to attract 3,500 people during the course of the day. The event consists of several different components, including exhibitors, speakers, and entertainment. Note that each committee member does not need to personally do all the work related to their position. They are responsible for making sure the work gets done. In many cases, CAA will recruit additional volunteers to take on tasks at the committee member’s direction. There is some flexibility in these positions. We may add programming that requires new positions, and we may shift responsibilities to different positions based on individual skills, interests, and availability. If you’re interested in joining the Planning Committee, please contact Tori Meltzer at victoria.meltzer@exploreveg.org. Everyone on the committee needs to have strong organizational skills with the ability to keep track of many tasks over several months. All committee members need to have basic computer skills and be comfortable using email and other online tools. Excellent written and verbal communication skills are also required. Committee members are expected to attend most committee meetings, report on the progress of their tasks, and respond to group communication on a regular basis. Typically, the time commitment ramps up over the course of the planning period. Initially, it will require two to three hours per week. Later, the time requirement may increase to four to six hours per week. The last few weeks before the festival may require as much as five to ten hours per week. However, this time commitment varies based on requirements of the specific role, as some positions may be busier further out and not as busy as the festival approaches. Most of these positions are demanding enough that we do not recommend combining them. The positions marked optional are small enough that they could be combined with another job, or several of those optional positions could be combined into one. Know everything about the event. Know what needs to gets done when and what is most important to do at any time during the planning. Make sure the entire committee is on track for success. Create timelines and to-do lists for every step of the event, including planning, day-of, and post-event tasks. Assign tasks (with due dates) to committee members or other volunteers as appropriate. Check in with committee members on a regular basis to make sure that they have all the resources they need to complete their tasks. Schedule meetings and send meeting reminders as needed. Make sure meetings run efficiently. The Committee Chair must be a detail-oriented, responsible person with excellent written and verbal communication skills. They need to be able to keep track of both short-term and long-term plans simultaneously, and they need to be willing to pitch in to help as needed. The Committee Chair’s workload will be fairly consistent. Close to the event, the work will ramp up, especially if unexpected things happen. Collect contact info for local media and relevant blogs. Write and distribute press releases to all relevant media. Get the event listed in local calendars, both online and in print. Be the first point of contact for the media. However, it’s fine to send requests for interviews to another committee member as appropriate. The Media Outreach Coordinator must be a good writer who can develop interesting tactics for getting media attention. They must also be capable of online research to identify local media outlets and the contact info for them. The Media Outreach Coordinator will be most busy a few months before the festival, since it’s not really effective to do media outreach too far in advance of the event. However, research for this outreach should start at least six months before the festival date. Work with a graphic designer to create advertising materials. Alternatively, the Advertising Coordinator can do the design themselves if they have the skills to do so. Research advertising opportunities in local media, blogs, and on Facebook and Google. This includes gathering requirements, costs, and deadlines for all these forms of advertising. Coordinate the distribution of print materials, such as flyers and posters. This task requires identifying the best places to distribute materials, working with volunteers to distribute the materials, and keeping track of where materials have already been placed. The Advertising Coordinator should be familiar with modern graphic design tools and formats to communicate clearly with a graphic designer, print shops, and online ad hosts. They also must be a very clear communicator, able to clearly articulate requirements, especially when working with an external graphic designer. The Advertising Coordinator will focus on coordinating designing and printing at first, and then shift focus to the distribution of printed materials. Make sure content is created for the festival’s blog. They can write the content themselves or work with other volunteers to share the writing duties. Syndicate all blog content to Facebook, Twitter, and other social media networks as appropriate. Create relevant content for each social media site. For Facebook, this can include posting smaller updates and images. For Twitter, this often means engaging in conversation directly with bloggers, sponsors, exhibitors, and other interested parties. The goal is to engage people so that they share and comment on the Twin Cities Veg Fest content. The Social Media Coordinator should be a good writer who understands how each of the relevant social media sites works. Ideally, they will be online often enough to effectively engage in discussion on Facebook and Twitter. The Social Media Coordinator will be more busy as the festival approaches. The frequency of social media posting can start at just once a week about six months before the festival, and it should gradually ramp up to every day in the last few weeks before the festival. Identify potential sponsors and exhibitors, including national and local business, organizations, and restaurants. Create sponsor and exhibitor recruitment materials. These materials should probably take the form a persuasive single sheet prospectus outlining the benefits of sponsorship or exhibiting. Coordinate outreach to potential sponsors and exhibitors. This will involve mass emails, personal emails, phone calls, and some in-person visits. Ideally, there will be at least two other people helping with this outreach. Make sure that the appropriate committee members follow up with committed sponsors and exhibitors. The Sponsorship and Exhibitor Recruitment Coordinator must have excellent written and verbal communication skills with an understanding of commercial sales, including an idea of what target sponsors and exhibitors most value. They must be comfortable with phone and in-person outreach to potential exhibitors. They should also be capable of conduction comprehensive online research in order to successfully identify the greatest number of potential sponsors and exhibitors. The time commitment for this position will be more extensive in the first few months of planning for the festival. Follow up with festival sponsors to collect the information needed to include them on the event website, including a blurb, website link, and logo. Ask sponsors to fill out the exhibitor application form if they are planning to exhibit. Follow up with sponsors to collect any additional materials, such as items for putting into swag bags or ads for programs. This communication may include sending multiple email reminders as needed. Make sure that the volunteers coordinating the bag stuffing are aware of what sponsor materials need to go in the bags. Thank sponsors after the event and ask them to provide feedback on their experience. The Sponsorship Logistics Coordinator must have excellent writing skills, as most of the communication with sponsors will be through email. Since the event usually doesn’t have a large number of sponsors, this position does not require a big time commitment. It requires responding to sponsors as they come. This process can begin many months before the festival, though most sponsors commit later, within the three months leading up to the festival. This Sponsorship Logistics Coordinator is also responsible for sending a number of reminders to the sponsors as the event approaches. This position could be easily combined with either the Sponsorship and Exhibitor Recruitment Coordinator position or the Exhibitor Logistics Coordinator position. Make sure exhibitors provide any materials needed, including text and logos for the event website, food permits, and exhibitor fee. This communication will often require multiple interactions with each exhibitor. Create clear exhibitor guidelines and make sure that exhibitors are aware of them. Coordinate shipping exhibitor table supplies from/to exhibitors as needed. Write clear exhibitor instructions that identify where and when to unload and load, where to set up their exhibit, how many attendees to expect, etc. Plan the exhibitor hall layout to make sure that all exhibitors get what they need, including the correct number of tables and access to electricity if needed. Be the primary point of contact for all exhibitors on the day of the event. Thank exhibitors after the event and ask them to provide feedback for us on their experience. The Exhibitor Logistics Coordinator will be most busy in the two months before the festival, as well as on the day of the festival. Determine how many volunteers are needed for every aspect of the festival, including pre-event, day-of, and post-event tasks. Update descriptions for each position. Create a complete schedule for all volunteer shifts, noting where shift leaders are needed and determining how many volunteers are needed for each position. Recruit and schedule volunteer leaders. This will require individual emails and phone calls. Arrange for each volunteer leader to receive the training they need. This training is either a phone call or an in-person meeting where the coordinator or another committee member reviews the position details with the volunteer leader. Recruit volunteers for all positions. This will require mass emails, social media posts, as well as individual emails, phone calls, and text messages. Schedule interested volunteers based on their availability, skills, and preferred positions. Check volunteers in as they arrive on the day of the festival. Direct them to their volunteer leader and give them a Twin Cities Veg Fest t-shirt (if appropriate). Other committee members can help with this check-in process. The Volunteer Coordinator should be a friendly, well-organized person who is comfortable reaching out to people one-on-one. They should be good at working with others on the committee to compile volunteer instructions. They will also need to have excellent verbal communication skills in order to effectively train volunteer leaders and direct volunteers when they arrive at the festival. The time commitment for this position becomes more extensive in the last three months before the festival. Research and recruit speakers to speak at the event. This will require mass emails, personal emails, and possibly phone calls. Work with speakers to come to a mutually acceptable agreement regarding travel reimbursement and speaking fees. Make sure speakers know when and where they are speaking. Help speakers coordinate travel if they are coming from out of state. Typically this requires finding volunteers to take them to and from the local airport, train station, or bus station. Make sure the speaker room has the appropriate A/V equipment. Make sure speakers know what equipment they are expected to provide. Typically, this equipment will just include a laptop if they are using slides for their presentation. The Speaker Coordinator should be a friendly person who is well organized and comfortable contacting well-known figures in the animal advocacy community. The beginning stages involve recruiting and vetting speakers. Closer to the event, the position includes arranging for travel and other logistics. Be responsible for keeping the event website up to date as needed. They will coordinate with other committee members on these changes. Add new sponsors and exhibitors to the website listing in a timely manner, ideally at least once a week. The Webmaster should have at least basic computer skills and be comfortable with content management systems like WordPress. Basic HTML and CSS experience is also extremely helpful. This position has a moderate time commitment. The Webmaster will be most busy when first launching the site (six to nine months before the festival date) and then again in the last month leading up to the event, updating the exhibitor and sponsor listings. Research and recruit chefs to speak at the event. This will require mass emails, personal emails, and possibly phone calls. Work with chefs to come to a mutually acceptable agreement regarding travel reimbursement and speaking fees. Make sure chefs know when and where they are doing their demo. Help chefs coordinate travel if they are coming from out of state. Typically this requires finding volunteers to take them to and from the local airport, train station, and bus station. Make sure the chef room has the appropriate equipment. This includes a station for preparation as well as video projection so the audience can see what the chef is doing. Make sure chefs know what equipment and supplies they are expected to provide. CAA will provide basic equipment, including knives, cutting boards, and bowls, and the chef may need to bring any specialty equipment they need. The chef will also provide ingredients, as well as premade food for audience samples. On the day of the festival, coordinate volunteers to prepare food, distribute samples, and assist with the chefs as needed. The Cooking Demo Coordinator should be a friendly person who is well organized and comfortable contacting well-known figures in the vegan food community. The Cooking Demo Coordinator will start with recruitment and getting materials (such as photos of the chefs) from the chefs for promotions. Closer to the festival, their focus will be on presentation details and securing on-site equipment. Plan the CAA information and food giveaway tables for the table, including volunteer instructions, supplies, layout, etc. Work with the Volunteer Coordinator to ensure volunteers are recruited for the table. Work with the Supplies Coordinator to make sure that we have the necessary supplies for the tables. Manage these tables on the day of the event. The CAA Tables Coordinator should be a friendly, well-organized person who is good at leading volunteers. The person who fills this position does not need to come to more than one planning meeting. This position is substantially less work than most other positions. Work with the committee to make sure that all necessary supplies are brought to the festival and conference. Take inventory of festival supplies stored at the CAA community space. The Supplies Coordinator should be a well-organized, detail-oriented person who is comfortable with spreadsheets. The person who fills this position does not need to come to more than a few planning meetings. This position is substantially less work than most other positions. Be the main point of contact between the committee and the venue. Work with the venue on electrical and equipment needs. Work with the venue to coordinate waste management. Work with the Exhibitor Logistics Coordinator on the event layout and electrical needs for exhibitors. Work with the Speaker Coordinator and Cooking Demo Coordinator to make sure that the venue meets our needs. Plan signage as appropriate for the venue. Come up with a plan for minimizing waste, focusing on effective composting and recycling. Work with the Venue Coordinator on waste management. Work with the Exhibitor Logistics Coordinator to make sure that exhibitors bring compostable items. Come up with a day of plan to ensure that compost and recycling are not mixed or contaminated.